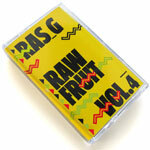 This is the fourth and final installment in Ras G's popular Raw Fruit series. Features Jeremiah Jae and Kahil Sadiq (Shafiq Husayn). The ''raw fruit'' theme stems from G's attention to wellness and a raw, vegetarian diet. Do the Right Thing was the inspiration for the design created by Seth Ferris. The proposed tag line never made the cut, ''Do the Ripe Thing -- a Ras G Joint,'' but we still love it. Vinyl LP version due out Fall 2015. 12. What Would Paul Mooney Say?